Your one-stop Toronto event catering company. Kiss the Cook develops unique event experiences featuring customized food and cocktail menus, all delivered with the kind of exceptional service and attention to detail that you’d expect from one of the Greater Toronto Area’s top catering firms. Whether it’s a simple backyard barbecue or a formal dinner for 500 people, their event planners and team of experienced bartenders, wait staff and delivery personnel will bring it all to life. They cater everything from corporate events to social events including weddings, receptions, baptisms, baby showers, birthdays, anniversaries, and more. Their team of passionate chefs, event planners and staff are dedicated to making your event vision a reality. They provide a fully customized experience tailored to your needs, delivered to perfection. Just ask them how they can make your corporate party, wedding or special event a success. 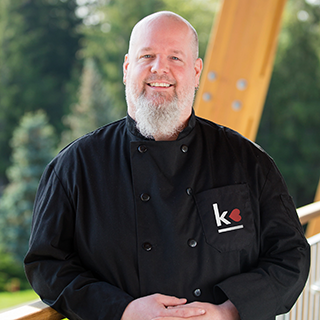 As Kiss the Cook Catering’s executive chef, Steven is responsible for managing food preparation for our catered events, while also developing delicious new dishes in our Food Studio. With more than 30 years’ experience in the industry, Steven’s minimalist approach to cooking is still influenced by those early days spent preparing meals with his mother. He constantly researches global food trends and looks for innovative new ways to prepare scratch-made comfort foods and other tasty dishes using simple, local and fresh ingredients.